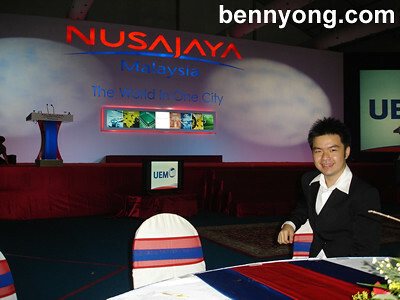 Today I was privileged to be invited to the official launch of Nusajaya Ã¢â‚¬Å“The World In One CityÃ¢â‚¬? development by UEM in Johor. It is the key flagship zone of the Iskandar Development Region (IDR), a special economic zone under the 9th Malaysian plan. Nusajaya boasts 6 signature developments which are EduCity, International Destination Resort, Johor State New Administrative Centre, Medical City, Puteri Harbour, Residential Developments and SILC (Southern Industrial and Logistics Clusters). It is the largest ever private sector development in Southeast Asia covering 24,000 acres. It was officially launched by the Prime Minister of Malaysia, YAB DatoÃ¢â‚¬â„¢ Seri Abdullah Badawi (Pak Lah) which arrived on time. The whole event proceeded as scheduled which is rare. We were served a selection of food as pictured which consisted of Satay, Otak-otak, Bread Pudding, Scones, Murtabak, Spaghetti, Quiche, Mixed Fruits and some other local delicacies. 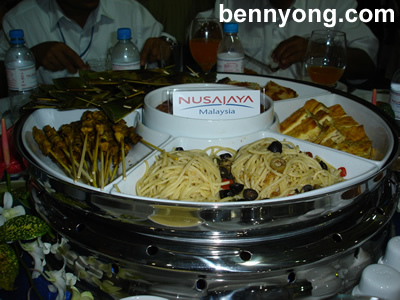 The catering was handled by The Puteri Pacific, Johor Bahru and the food was selected specially to reflect the key developments of Nusajaya. For example, Spaghetti had this accompanying tagline in the menu Ã¢â‚¬Å“Who didnÃ¢â‚¬â„¢t eat pasta at Uni?Ã¢â‚¬? which represent EduCity. The tent that we were housed in for the event was apparently the largest in South East Asia and it could fit a Boeing 747. 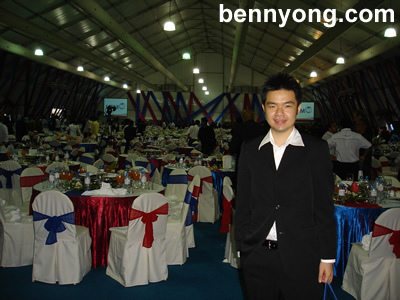 No wonder it could easily serve as a shelter for over 2000 guests in 200 tables. The launch cost UEM about RM2 million but I believe it could have been much more. Now I am all drained out from being in car for about 7 hours in total for a day trip to Johor. So, thatÃ¢â‚¬â„¢s all for now and until my next post, take care.